As you travel, you’ll find you need a pouch to carry your cables and smaller computer or cellphone accessories. I used a soft zippered ditty bag to keep weight down, but STM Bags just came out with STM Cable Wrap Portable Organizer — which looks promising as a way to keep your cables and chargers organized and tangle-free. The first thing I look at is weight. STM says “light weight” and is .4 pounds, 6.4 ounces or .2kg. Depending on how much carrying you will do, a single ounce can be too much, but this is probably great for most people and trips. In the end, it’s subjective. Now that the bag qualifies for consideration, I look at the overall size and the pocket organization. These things are more in the eyes of the beholder. 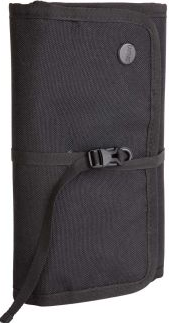 The Cable Wrap Portable Organizer rolls open and closed. It’s got an internal mesh zipper pocket and a slide-in mesh pocket on the other. In the center you’ll find 3 or 4 smaller slide-in pockets. 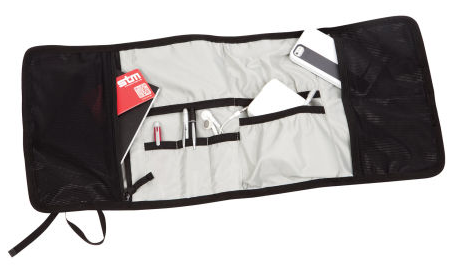 STM Bags’ Cable Wrap Portable Organizer is $25 MSRP. You can learn more about this cable organizer at the STM site. There is also a video there so you can see it in action. It is available from that page and at various retailers and distributors including Radtech. As I like and recommend Radtech, here’s a direct link to it at Radtech. STM Cable Wrap is designed in Australia and assembled in Vietnam. STM Bags makes various laptop bags, tablet and smart phone cases, and accessories. I have to remind you that I haven’t tried this organizer yet, so at this point consider it a recommendation to check out.